IT'S one of the hottest topics in the country today. In fact, it's so emotive that the Church of England has waded in to have its say. IT'S one of the hottest topics in the country today. In fact, it's so emotive that the Church of England has waded in to have its say. Even the BBC are getting involved. And it's said the Queen is taking an interest. It's not Brexit, equal pay or the UK's economy but the issue of single-use plastics. Single-use plastics are products that are used once and then discarded, such as water bottles, plastic cups, straws, take-away coffee cups, stirrers and most food packaging. Whether our plastic waste ends up in landfill, our countryside, our streets, our beaches or the sea, it can have a catastrophic effect on our wildlife, birds and marine life. After the BBC's Blue Plant II highlighted the scale of sea pollution caused by single-use plastics, the public outcry caused the organisation to announce it would ban their use by 2020. The Queen is supporting efforts to reduce single-use plastics on royal estates and the Church of England has urged Christians to give them up during Lent. But, as individuals, can we really do our bit to tackle such a massive environmental threat? One Fishponds woman believes we can. Cath Moore felt so strongly about what we are doing to our planet that she made it her mission to replace single-use plastics in her home. 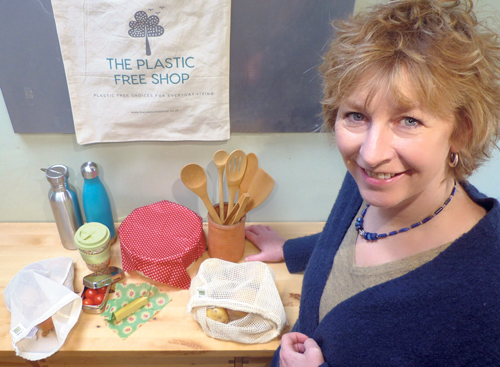 Inspired by many of the products she discovered, Cath has just launched a website - www.theplasticfreeshop.co.uk - after spending the past year sourcing ethical and sustainable alternatives to everyday single-use plastic items, such as toothbrushes, utensils and lunch boxes. "The products at The Plastic Free Shop are a result of my own journey and quest to have a life with less plastic," Cath said. "People can be assured that I've done my research and tested the products. I try to be as open as possible and give a good description of each product." The 54-year-old operates the business from her home in Brook Road, even offering local people the chance to collect items from her at pre-arranged times to cut down on packaging costs and waste. Clearly, single-use plastics is a subject Cath feels passionate about. "My brother is a conservation photographer and does a lot of work with the Oceanic Society and the Plastic Pollution Coalition and went off on a think tank with scientists and conservationists. He came back with a film and when I watched it, I felt really emotional. I then went to the premier of the Plastic Ocean in Bristol and it blew me away. It was a real shock to my system and I thought I need to do something." Cath started by making small changes: "As a family, we've always been environmentally friendly and aware of wildlife but there was so much more I could do as an individual. I'd never felt this fired up about anything before. "I just started looking around me and started to make simple changes. One of the first things I replaced was my toothbrush. It’s a truly frightening reality that every toothbrush ever made still exists somewhere on our planet. Just think of all those toothbrushes you have ever used and disposed of – they are still there!" Cath switched to a bamboo toothbrush, a natural product which is easy to grow without pesticides and as an added bonus the plant needs hardly any water to grow. "Even a scourer which has a sponge bottom and a green top doesn't biodegrade. It's full of plastic. I looked around and found products which are brilliant. They're so old school and simple but they work better and are compostable." Cath, a former cartographer, went on to replace her plastic water bottle with a stainless steel one and has now discovered there are free refilling stations cropping up everywhere and even several cafes in Fishponds are offering this service. Her shampoo bottle has been replaced by a shampoo bar: "It takes your hair a while to get used to but after a while it becomes really soft and shiny because you're not stripping it of any oils. I wouldn't go back now. I love it. "It's easier than you may think to make simple changes to daily habits and around the home which will reduce the amount of plastic and waste." It hasn't however been easy to source products for her website that Cath feels are the real deal. Anything which arrived at Brook Road bathed in unnecessary packaging was immediately rejected. "It's taken quite a time to find good suppliers with the same ethos as I have. It's been a bit of a learning curve. Everything that I sell has been sourced very carefully and I have a zero plastic pledge on my postage and packing. "I'm not telling everyone to go around their house and get rid of every single-use plastic item but when things run out or need replacing, like a lunch box, then consider alternatives like a stainless steel lunch box, which is much more robust and doesn't leak." Cath, who has a 24-year-old daughter, believes her online shop has come at the right time and senses there is a mood for change in the UK. "Consumers have cut down on plastic shopping bags since the 5p charge was introduced and I think that's started a ripple effect.My message is that as individuals we can make a difference because, as consumers, we drive demand. As people start shopping a bit more consciously and become a bit more demanding about what they want, manufacturers have to respond. In fact they'll have to if they want to survive." You can also look out for Cath and her products at various events, such as farmers markets and fairs, in and around Fishponds and Bristol.